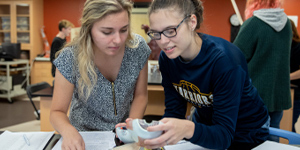 Waynesburg University’s Trading Room helps students gain valuable, hands-on investment and trading experience. Students have the ability to experience actual trades and mock-trading scenarios and are equipped with the skills necessary for related job markets upon graduation. 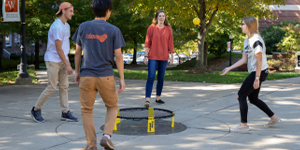 The Student Investment Club offers opportunities for students to experience growth in learning. Club members apply and refine theories and skill sets learned in class through real-life scenarios. Students at Waynesburg also have the opportunity to be a part of the University’s Business Club. Membership is available to all regularly enrolled students at Waynesburg University and other community entities that are interested in the economy. The mission of the organization is to provide members the best opportunity to make a difference and develop leadership, teamwork, and communication skills through learning, practicing, and teaching the principles of free enterprise. Membership in Sigma Beta Delta, a national business honor society, is the highest national recognition a Business student can receive at a college or university with a chapter of the organization. The purpose of Sigma Beta Delta is to encourage and recognize scholarship and achievement among students of Business, Management, and Administration and to encourage and promote personal and professional improvement with a life distinguished by honorable service to humankind. Waynesburg University’s growing prominence in international studies reflects a commitment to helping students understand their roles in a diverse society. Today’s fast-paced global economic environment provides new opportunities to put business skills to use overseas. Studies and internships are possible in Australia, China, Korea, New Zealand, Russia, Singapore, and other international business centers. Waynesburg University, a private Christian university near Pittsburgh, Pennsylvania, provides a valuable, personal, and hands-on educational experience that prepares undergraduate and graduate students for lives of purpose and continued growth. Business students build a solid foundation in the many facets of business while gaining a strong liberal arts background in writing, creative and analytical thinking, and ethical decision making. Department of Business Administration graduates have succeeded in an array of careers, from working at major accounting firms to Wall Street banking. Alumni have founded their own companies and launched rewarding careers in Fortune 500 corporations, government and public service, nonprofits, the health fields, education, and more. Waynesburg’s accredited Department of Business Administration offers major concentrations in Accounting, Business Information Science, Business Management, Energy Administration, Entertainment and Arts Management, Entrepreneurship, Finance, Forensic Accounting, Human Resources, International Business, Leadership, Marketing, Public Accounting, Sales Management, and Sports Management, plus a five-year integrated bachelor’s-to-master’s program in Business. The Master of Business Administration program offers concentrations in Applied Business, Energy Management, Finance, Human Resources/Leadership, Health Systems Administration, Market Development, and Project Management. The undergraduate and graduate Business programs are accredited by the International Assembly for Collegiate Business Education (IACBE). Waynesburg helps students develop academically and professionally on the foundation of faith. Faith is an integral part of the University’s mission, and students have the opportunity to discuss the theory and application of faith in their professions. Students may choose to practice their faith every Tuesday at Chapel, in their classes, in prayer or Bible study groups, through their artwork, while they’re serving others, or in their own individual ways. While guiding students in the development of specific skills and talents, Waynesburg also provides opportunities to apply and sharpen them through service. In fact, students, faculty, and staff spend approximately 50,000 hours each year working to improve the lives of others. Business students serve others with their business acumen by performing free tax assistance for local families, developing work schedules and managing sales for a seasonal local nonprofit retailer, or creating their own service projects. Consistently ranked as a top-value school, Waynesburg has emerged as a national leader in educational value. Most recently, the University was named to Money magazine’s 2017–2018 “Best Colleges for Your Money” list, ranking in the top 7% nationwide. More than 90% of students receive some form of financial aid each year, and tuition, room, and board are more than $10,000 below the national average for a four-year private nonprofit college. Between Achievement Awards and additional scholarships; federal, state, and institutional grants; a number of work-study opportunities; and student and/or parent education loans, Waynesburg University is quite affordable. Ninety-seven percent of 2016 graduates reported working full time or attending graduate school within one year of graduation. The Career Services Center works to ensure the successful transition from college to career for each student, offering assistance with everything from résumé composition and interview skills to job fairs and employer networking opportunities. Schedule a visit at waynesburg.edu/visit and apply online at waynesburg.edu/apply.